The Russian engineering and industrial group Tractor Plants Concern plans to establish an assembly facility for its CHETRA branded industrial machinery in India. The assembly factory’s opening will help leverage Russian manufacturers’ business not only in India but also in the South-East Asian countries, Tractor Plants Concern VP, Global Markets Vladimir Lepin stated during an international building exhibition Bauma CONEXPO Show India held in Mumbai in early February. The new assembly plant should reach its output target of 200 units annually by 2015. Russian specialists will simultaneously train and develop the skills of local engineers involved in the machinery manufacturing and maintenance, the company said. Tractor Plants Concern presented its best models of CHETRA bulldozers and pipe layers at the Mumbai exhibition. The concern has incorporated a specialised subsidiary, Chetra Machinery India Pvt. Ltd. (CMI), to serve as a channel for supplying its innovative products to India. “The Russian machinery marketed in India currently includes 90-600 hp bulldozers, pipe layers with a lifting capacity in excess of 600 tonnes, 140-600 hp wheeled loaders with a bucket capacity of between 3.5 and 6.7 cubic metres, 23-tonne excavators, and other specialised equipment,” CMI Executive Director Benjamin Callow said at the exhibition’s margins, according to a company press release. He added that the obvious benefits of the products supplied to India include affordability and reliability guaranteed by the best Russian technology. The director of the SBM Agency Pvt. 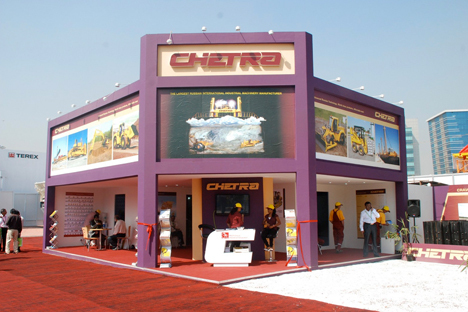 Ltd engineering company, the largest trading partner of Tractor Plants Concern’s Indian subsidiary, said that CHETRA branded bulldozers can significantly expand their local market share. SBM Agency Pvt. Ltd. has more than 20 years of experience in hydraulic and other work related to coal, lime, and granite mining using heavy-duty bulldozers, excavators, and track- and wheel-based loaders. “The CHETRA machinery boasts a unique design and build reliability. The key parts are suited for operating in India’s conditions, and the machines have had an excellent and steady track record. According to company management, by offering competitive pricing and high-quality after-sales servicing, Russia’s CHETRA brand will be able to expand its share of the bulldozer market as well,” the company director said. Tractor Plants Concern, an engineering and industrial holding company, is one of Russia’s largest integrators of scientific, technical, manufacturing, technological, and financial engineering resources both in Russia and globally. The engineering holding company manages more than 20 major companies located in ten Russian regions, as well as in Denmark, Germany, Austria, the Netherlands, Serbia and Ukraine.